With sturdy build quality, sombre dark grey styling, and a standard TFT screen, the HP Compaq nc8430 (£1291 inc. VAT) is aimed at the business user. You'll find a 16:9 aspect ratio widescreen panel, with a resolution of 1680 x 1050 pixels (WXGA) in place. Images are sharply defined, although the colours lack lustre. At 15.4-inches, there's plenty of room on-screen to open two documents side by side, and the aspect ratio is ideal for watching DVDs. A dedicated graphics card supports the display - an ATi Mobility Radeon X1600 using 256MB of video memory. This led to a 3DMark 2003 score of 6535, which is enough to cope with graphically intensive applications. Multimedia presentations are dealt with without problem. A good-sized keyboard sits in the middle of the chassis, and the keys move with precision and a firm weighting. Instead of placing peripheral keys at the side of the keyboard, HP has moved them above, creating room for speakers on each side of the chassis. There's a touchpad and a pointing stick for navigation. With dimensions of 358 x 258 x 37mm, the HP is not the smallest machine, but a 2.8kg weight keeps it semi-mobile. 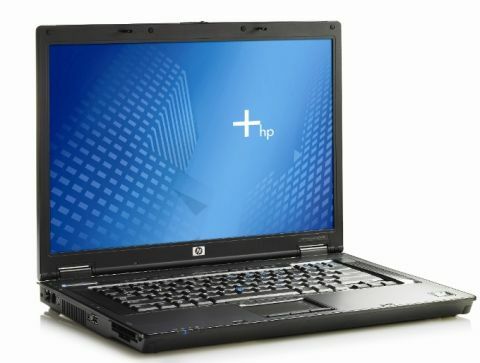 Despite the relatively thin chassis, the HP is sturdy, able to stand up to the rigours of everyday use. Rubber stops protect the screen when the clamshell is shut, and a double catch stops the screen from opening accidentally. An Intel Core Duo T2500 (2GHz) lies at the heart of the machine, along with 1024MB of DDR2 memory. There's an 80GB Fujitsu hard drive, rotating at 5400rpm. This is enough to achieve a MobileMark 2005 score of 223, enough to run multiple applications simultaneously. A battery life of 241 minutes, under test, is a very respectable result, enabling working away from the mains for decent periods. Connectivity is good, with a VGAout and S-video port. You'll also find a Bluetooth adapter, and three USB 2.0 ports. A mini Firewire port enables connection to digital camcorders, and a 3-in-1 card reader lets you save files on a variety of different formats. There's also room in the chassis for an LG multi-format DVD rewriter. For connecting to networks, both wireless and fixed, you'll find, respectively, an 802.11a/b/g wireless adapter and Gigabit Ethernet. The HP makes a strong case for itself by doing everything reasonably well. Although not outstanding in any one area, it provides a compelling mix of performance, features and strength.